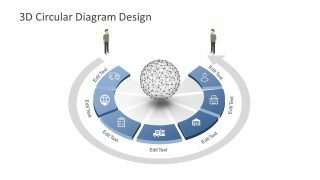 The Free 3D Circular Diagram Design is a professional layout for systematic business presentations. Although it can serve as a seven-point agenda diagram. Its where the company can explain the business goals, current situation, and opportunities for the future. The diagram lays out the seven options with a sphere of network connections. It portrays the strong core with 3D segments and clipart icons. PowerPoint contains two free slides with variation in design. For example, the second slide contains two user clipart shapes. These can help explain the transformation from left to right through step-by-step processes. For example, the company’s ability to acquire potential investors. Or, the product journey, seller-buyer concepts of sales and marketing. Therefore, it is an ideal PowerPoint to explain value proposition campaigns. 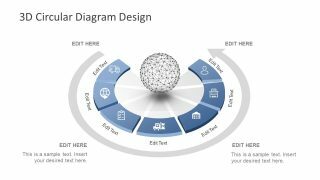 The Free 3D Circular Diagram Design is a strategy PowerPoint with visually impressive elements to fine-tune ideas. The semi-circle diagram of 3D segments initially has a blue and white theme. However, the users can make modification in colors, sizes, moving an object or replacing icons. Additionally, they can add or delete the 3D segments from the semi-circle diagram if required. The core of the free 3D diagram as network hub illustrate the idea of sharing information between each stage. Like each of the seven segments sharing information through the center. It is an exceptional template for entrepreneurs, innovative marketers and business analysts. Because it can help explain the complete workflow graphically in one slide. Since these free slides contain icons like trucks, warehouses, and global shipping. The professionals working in the operation industries i.e. logistics or supply-chain can benefit from these 3D circular diagrams. The PowerPoint diagram of a circular model has a decorative 3D design of sphere in the middle. But users can replace this editable shape with the object more relevant to their presentation. 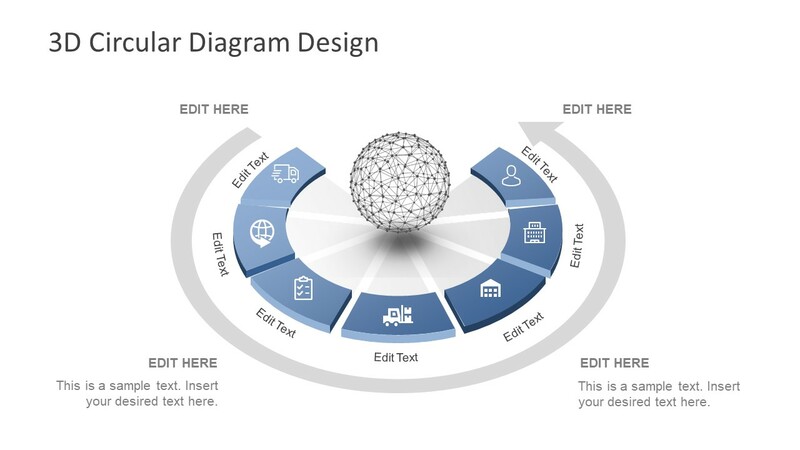 Also, Slidemodel has more template designs of semi-circle diagram for the 3D value proposition.